Educational TV Game Show style presentations for schools, colleges, universities, youth groups, community service organizations, professional organizations, small, mid-size and large businesses. Focus areas include: improving safety, performance, and communication, career preparation, understanding how people sense, perceive, think, and respond. Sample presentation titles include: 1) Activities To Facilitate Career Planning and Gaining Meaningful Employment; 2) Career Options With A Psychology Degree; 3) Effective Leadership Involves Working Through Others; 4) Games To Explain Human Factors: Come, Participate, Learn And Have Fun!!! ; 5) I'm Awesome, But I Have My Limitations; 6) Understanding Human Capabilities and Limitations: An Essential Ingredient For Ethical Management; 7) What Is It Like Working In Industry; 8) What's My Job: An Effective Career Orientation Program For Middle School Students. 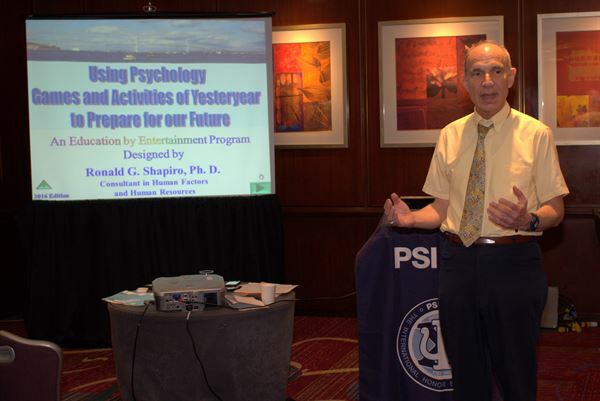 9) Using Psychology Games and Activities of Yesteryear to Prepare for our Future We also offer special programs for birthday and other special celebrations!!! Programs are more fun than a typical party and more will be remembered than from a typical lecture. Please view the photo album for an overview of our programs.